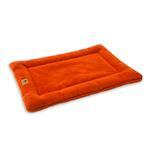 Dogs will love to cozy up on the Montana Nap Pet Bed by West Paw Design in Pumpkin! Made to be compatible with standard size kennels. Entire Montana Nap® is a one piece easy-to-wash dog bed that stands up to multiple machine washings. Made in Bozeman, Montana, USA. Matching Berber Bone, and Sequoia Squirrel Dog Toy sold separately.